1247 Henry V Pennies and Halfpennies. Broken annulets by crown. Durham and York mint. (4). Fine to very fine. 1221 Edward IV Pennies (3) Durham and York mints. All fine or better. 119 Edward I, II and III pennies of Durham mint (16). Different classes. All fine to very fine. 156 Hammered group (8). Edward I Penny, Durham mint. Edward III Halfpenny, Edward I Farthing, Henry VII Halfpenny, Henry V and 2 Edward IV Halfpennies. Together with Charles I Scottish twenty pence. Average fine. 716 Edward III penny, pre-treaty, Durham mint. Crozier on reverse. S. 1593. About very fine. 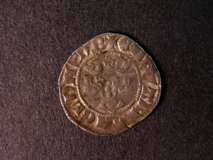 Henry VI penny annulet issue, Calais mint. S 1845. Very fine with small edge chip.